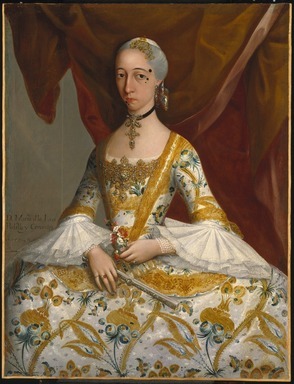 Dona Maria de la Luz Padilla y Cervantes (1732-1789). An oil painting by Miguel Cabrera which shows Dona Maria as a grown young lady. She is the same person as the preceding portrait as an adult. She is shown in a three-quarter view and length in a dress with heavy gold embroidery in a floral pattern against a white background. Her hair is powdered and she has beauty patches on her face. She wears elaborate jewels in her ears, at her neck, and a pectoral, also jewel rings and bracelets. She stands in front of a gold curtain and holds a fan in her right hand and flowers in her left hand. Condition: Good, it has been restored around the edges and on the dress b the Museum Laboratory.